For Honor is a unique take on multiplayer competition. Choosing to fight for the bloodthirsty Vikings, the honor-bound Knights, or the mysterious Samurai is the first step to dueling, slashing, and clobbering your way to the top of the faction leaderboards. Rather than the twitch-based run-and-gun that many gamers have come to expect from the online scene, For Honor requires a patience and deliberate style. Even in its PC version, a quality controller can mean the difference between glorious victory or a soggy defeat at the bottom of a ledge. The most important aspect of For Honor’s controls lies in the thumbsticks. Swapping in and out of different stances to avoid one katana or long sword can be tough when it’s a one-on-one duel, but it’s even worse when you’re facing down 2, 3, or even 4 other players! - Put a regular length concave thumbstick on the left side of your controller, and pair it with a regular length domed stick on the right. - The concave shape on the left thumbstick lets you really dig in, which you’re going to do a lot of when circling your opponent (or running away from four of them). - The domed shape helps you float between stances: blocking hits that would have torn your head off otherwise. As far as paddle configuration is concerned, the two most important face buttons in the heat of battle are your Guard Break (Square for Playstation, X for Xbox) and your Dodge (X for Playstation, A for Xbox). - Map the Dodge button to a left paddle: this keeps your movement and dodge on the same hand, making movements more fluid. - Map Guard Break to a right paddle. This leaves the right hand ready to change stances or attack should the opportunity present itself. Need to remap your paddles on the fly? Check out our EMR instruction guide! Long, tense duels means sweaty hands and plenty of tension, and getting the right handle on your controller means choosing the right grip and shell for your SCUF. 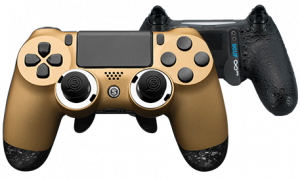 - SCUF Grip or Pro Grip handles are ideal for keeping your hands tight on the controller, game after game. 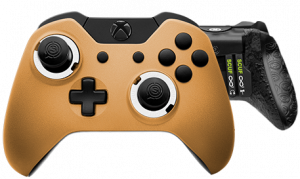 - SCUF’s Soft Touch finish means that your hands are comfortable and secure. Oh, and be sure to keep a bottle of GamerGrip handy, especially when your teammates all get slaughtered and you find yourself facing down 4 angry Vikings.